Today, I'm writing about the making of the Spanish language version of the horror classic, Dracula (1931). 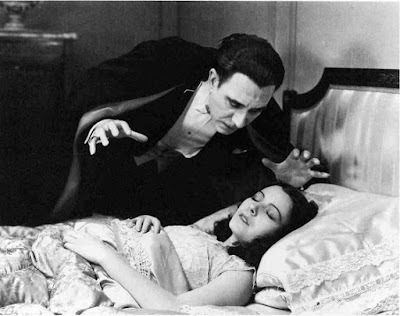 The film stars Carlos Villarias as Count Dracula and Lupita Tovar as his beautiful victim. 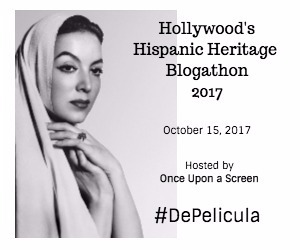 This article is part of Hollywood's Hispanic Heritage Blogathon 2017 hosted by Once Upon a Screen. The Spanish language version of Dracula (1931) holds a special place in the history of old Hollywood horror films. The story of the making of the film reveals the importance of the Hispanic market in the early days of talkies, the artistic genius of a now largely forgotten producer, and one of old Hollywood's longest-lasting love stories. 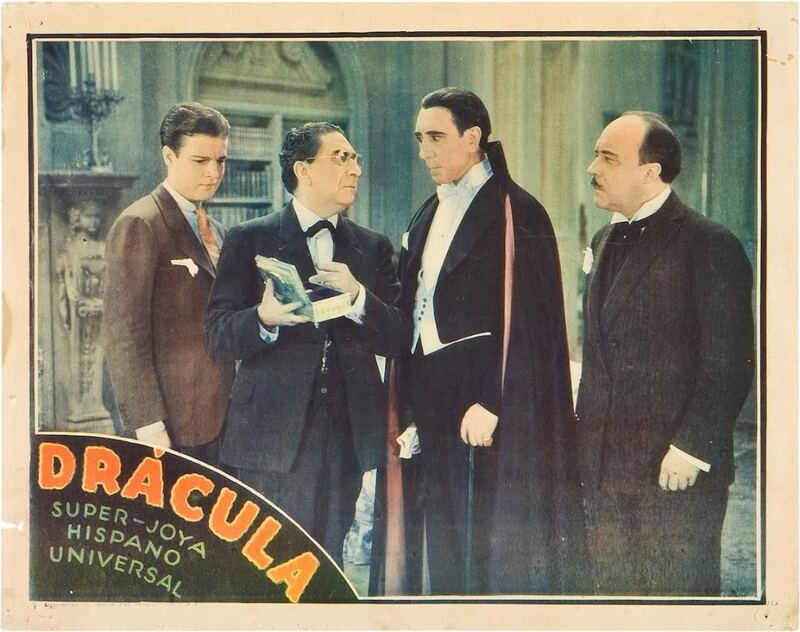 The Spanish version of Dracula was filmed alongside the famous 1931 English language film starring Bela Lugosi and directed by Tod Browning. The two films are based on Irish writer Bram Stoker's 1897 novel, which tells the story of a young English lawyer named Renfield (Pablo Alvarez Rubio) who goes to work in Transylvania for a mysterious aristocrat named Count Dracula (Carlos Villarias), who turns out to be a centuries old vampire. After Renfield is bitten by Dracula, the pair travel to London where Professor Van Helsing (Eduardo Arozamena) immediately recognizes the true identity of the suave bloodsucker. During the silent era, films were a truly universal art form with most old Hollywood studios translating title cards into several languages to take advantage of the foreign market; in fact, Universal Pictures, which produced both versions of Dracula, earned half of its revenue from foreign countries, according to writer and Dracula scholar David J. Skal. The advent of talkies saw Universal hemorraghing money until Paul Kohner, the Czech-born producer of the silent horror classic The Man Who Laughs (1928), approached studio chief Carl Laemmle with a fascinating idea: He could cheaply and quickly make Spanish language versions of Universal's horror movies by shooting at night on the same sets after the English-language cast and crew went home. Kohner's idea was not unique: reshooting films in different languages for foreign markets was commonplace in the early 1930s. Here's a clip of Stan Laurel and Oliver Hardy speaking in French, German, and Spanish for foreign language versions of their comedies. The penny-pinching Laemmle loved Kohner's proposal, and the producer got his first chance to put his idea into practice by filming a Spanish version of The Cat Creeps (1930), which was called La Voluntad del Muerto. For his leading lady, Kohner chose a beautiful Mexican actor named Lupita Tovar who had caught his eye during an audition at Universal. Kohner began bombarding a skeptical Tovar with flowers, chocolates, and phone calls, but his interest wasn't purely romantic. Kohner was impressed by Tovar's work on the Spanish sequences for the musical The King of Jazz (1930), and he felt she was the only Spanish-speaking actress in Hollywood who was talented and photogenic enough to carry off the female lead in La Voluntad del Muerto. Kohner's instincts proved correct. La Voluntad del Muerto was a huge hit and Tovar became a major star in Mexico where her public appearances sometimes even caused riots. The success of La Voluntad del Muerto led Universal to reteam Kohner and Tovar in a Spanish version of Dracula. The film was made on the same sets and with similar costumes (Lugosi and Villarias even shared the same toupee) as the English version of Dracula. "The American crew left at 6," Tovar told Skal. "We started shooting at 8." 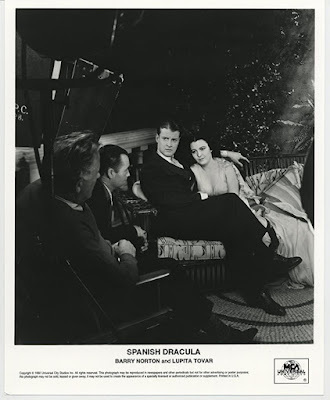 Director George Melford (left), cinematographer George Robinson and cast members Barry Norton and Lupita Tovar filming the Spanish language version of Dracula (1931). The shooting schedule went remarkably smoothly. The Spanish language Dracula completed filming in an astonishing 22 days, compared to the seven weeks it took for the English-language version. The film premiered in January 1931, and it was rapturously received in both the English and Spanish press with even Lugosi giving it the thumbs up (he called it "beautiful, great, splendid," according to the Hollywood Filmograph). The film and Tovar also received a great deal of positive attention in the Mexican press, and Dracula proved to be a sizable hit in both Mexico and American cities with large Hispanic populations. 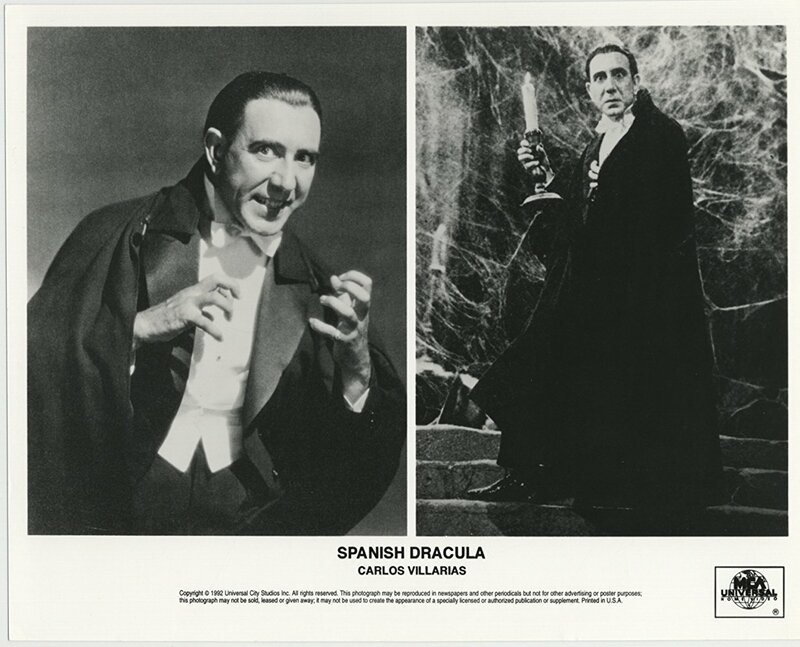 The Spanish language version of Dracula was thought to be a lost film until the 1990s when the UCLA Film and Television Archive worked with the Cinemateca de Cuba to restore the movie (there's more on that here), which allowed horror fans to see the movie in its entirety for the first time in decades. Many scholars believe the Spanish language Dracula is the best of the two films with Skal calling the Spanish version, "a shot-by-shot scathing critique of the Browning version." Carlos Villarias as the title character in the Spanish language version of Dracula (1931). Personally, I admire both versions of the films and I encourage anyone who is interested in old Hollywood history to watch both movies. While the English version has the better cast (no one, not even Christopher Lee, can touch Lugosi as Dracula), the Spanish version is more atmospheric, borrowing its German Expressionist style from films like Nosferatu (1922) and The Cabinet of Dr. Caligari (1920). Director George Melford and cinematographer George Robinson make wonderful use of Universal's famous crane for Dracula's introduction, and the shipwreck scene remains one of the crowning achievements of Universal's horror films. Kohner and Tovar married in 1932 and they remained married until his death in 1988. Tovar, who passed away at age 106 on Nov. 12, 2016, often gave interviews in her later years about her work with Tovar and the collaboration on Dracula (clip below). The Spanish language Dracula is available on a DVD that also features the English language version. This was fascinating, and I learned some things I hadn't heard before reading your blog. Thank you so much for sharing this important piece of film and cultural history for all of us!